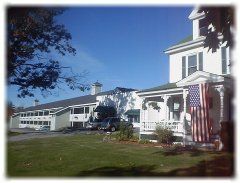 There's no better all-year playground than Western Maine, and in the heart of this fabulous region is the spectacular River View Resort, located on the outskirts of the community of Bethel. There's so much to see and do in the woodsy countryside including hiking, river rafting, rock climbing, and nature photography. Families with kids will find no end to the fun and adventure, and couples will create special memories while staying in one of these premier timeshare suites. These Maine timeshares for sale feature luxurious 2-bedroom suites available here on the resale market. Imagine a fun summer day on the hiking trails or a wonderful winter day skiing the nearby slopes. Then imagine coming back to a tastefully decorated resort suite and enjoying a fine home-cooked meal prepared in the fully equipped kitchen. The timeshare suites at River View Resort are fully furnished and can accommodate up to five individuals. These suites feature a queen or king bed in the master bedroom plus double or twin beds in the adjacent bedroom. There's also a sleeper-style sofa for that extra guest. The kitchen is fully equipped with all the necessary cookware and utensils, and the living room has a full-sized sofa, large-screen TV with cable access, Wi-Fi, and entertainment system. Each of the suites also comes with a private balcony overlooking the courtyard, nearby meadows, or the distant forest. These Maine timeshares for sale are available with guaranteed reservation dates and extra perks including full access to the resort's on-site amenities, making this the perfect way to enjoy a Maine vacation. On-site is a gaming room, workout center, heated pool, hot tubs, and sauna. There's a large outdoor barbeque area with plenty of benches and chairs for group dinners. Near the resort are several cross-country ski trails, and car rental is available for winter trips to the Western Maine downhill ski centers. Bethel is a beautiful community full of interesting shops, restaurants, and grocery stores featuring locally grown produce and locally baked breads. Get in on the fun by buying a two-bedroom resort suite at the River View Resort complex. It will be one of the most memorable vacations you'll ever take. Contact River View Resort, The Specialist Today! Days: Friday, Sunday / Time: 3:00 P.M.